Midnite Solars' grey powder-coated Steel Battery Enclosures with locking doors are ETL Listed for the US and Canada for indoor use. They are for use with sealed AGM or gel batteries. The Heavy Duty Plastic Enclosures are designed to hold Flooded L-16 type batteries and is made from high density polyethylene (HDPE) sheet. 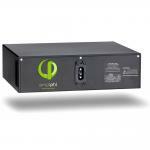 The box has an insulated base with removable middle section that minimizes lifting, easing battery installation. The plastic is easy to drill with hole saw to attach conduit fitting for inverter cables. A hydrogen vent tube in the top should be extended to exterior of building. 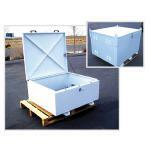 The Aluminum Chest Style Enclosures come in either insulated or non insulated. 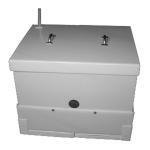 Pad mount, chest style enclosures are manufactured with 0.125" 5052-h32 aluminum. All enclosures are provided with integrated louvers located to promote convective air flow through the enclosure to reduce internal temperatures and remove gasses. NEC codes generally require that a battery bank has to be installed in some type of enclosure separate from the other electrical equipment. Your battery box should be sized and strong to hold the batteries allowing for air to move between the battery casing. If the battery box is located above the ground it should be in a location out of direct sunlight. Additionally the batteries should be stored in an area to avoid dramatic temperature swings if possible which will improve the life cycle of the batteries. Batteries can be stored in appropriate boxes, on the deck (concrete) despite wives tails which advise otherwise. The battery box or enclosure may be insulated or there are cooling and or heating accessories available to protect the battery bank from extreme temperatures swings. Battery racks should be made from ridged materials that are resistant to deterioration. If the battery bank is placed on racks, the rack should be of sufficient strength to support the bank with room to spare. Any parts in direct contact with the battery terminals should be electronically insulated. 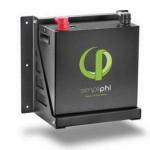 The battery storage system should also be constructed in such a way as to contain any potential spill. Pans or trays under the battery bank is a good idea if you plan on making a homemade battery box. Because flooded lead acid (FLA) batteries produce toxic, corrosive and potentially explosive outgases, ventilation for the battery bank is a must for FLA batteries and are recommended by AGM battery manufactures. Under no circumstances should your battery bank be located in an unvented area or unprotected area where someone may accidently short circuit the battery bank.